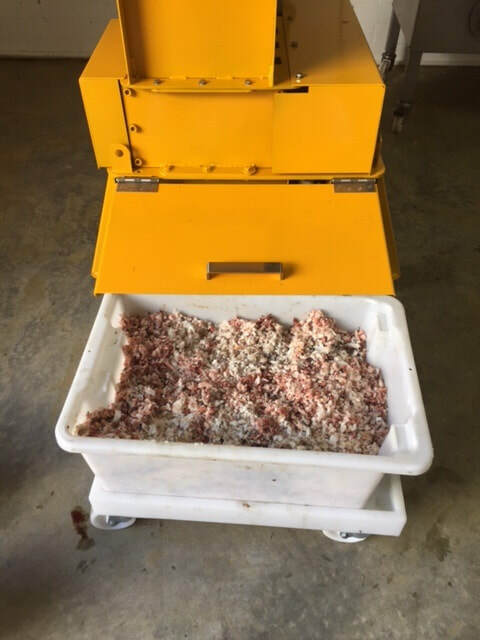 Shore Catch has custom designed and built a fish shredding machine. It has been a common question about whether the machine is available for use to shred customer’s frames, old bait, cray heads, crab shells etc. There was also the Fisheries issue that you can’t use recreationally caught fish for commercial gain. And of course, how do you control safety matters with a machine that is purpose built to turn flesh and bone into small pieces. Anyway, after much consideration we have decided to make the machine available subject to the rules set out below. We will not accept monetary payment for providing the service, however we would expect that you would patronise our shop as a customer. Available days are Monday and Tuesday mornings, but you would need to notify us that you are coming in at least 24 hours prior to attendance (some other times may be available subject to our workload). The weight limit on products is approximately 20kg per time – this is generally one tub, and any more than this consumes too much of our time (we will generally process 20kg in 5-10 minutes). The product is to be brought in frozen – we will not process thawed products. Raw material in an esky that can be then used for the shred is the best method. All plastic is to be removed prior to arrival – it wastes our time removing plastic, and worse still is that shredded plastic should not be placed in the ocean. We will not process undersized or protected fish – your load will be rejected and we reserve the right to notify Fishwatch (it is illegal to have them in your possession). You are to certify that your load contains no metal (hooks) as there may be liability for repair of equipment if it does – if in doubt don’t bring it in. You are to remain in attendance while your product is processed. You are not permitted to enter our work area; however, you may watch from behind a barrier. We will not receive and store raw material or product, and you are to take the product off-site as soon as it is produced. We will not accept your shredded product in exchange for any benefit whatsoever. We genuinely believe that processing fish waste for beneficial use is far better than it going to landfill. After shredding lots of fish waste for people, the above strategy has been developed so that we can provide the service in a managed way. We hope that you will take advantage of our offer, and it is made in good faith to provide a service for the benefit of recreational fishers. If you would like to discuss, please contact us.